One summer, Bob and I drove to Montreal to take in the Mosaiculture 2013 competition underway at Montreal Botanical Garden. 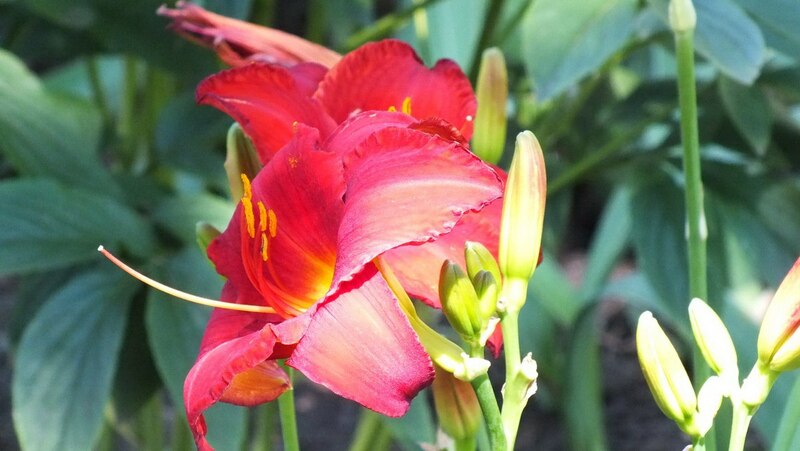 The Garden had so much more to offer, including 31 specialized gardens, and when we hit upon one of those, the Daylily Garden, I could not believe the number and varieties of daylilies covering endless flowerbeds…daylilies such as this ruby red beauty. 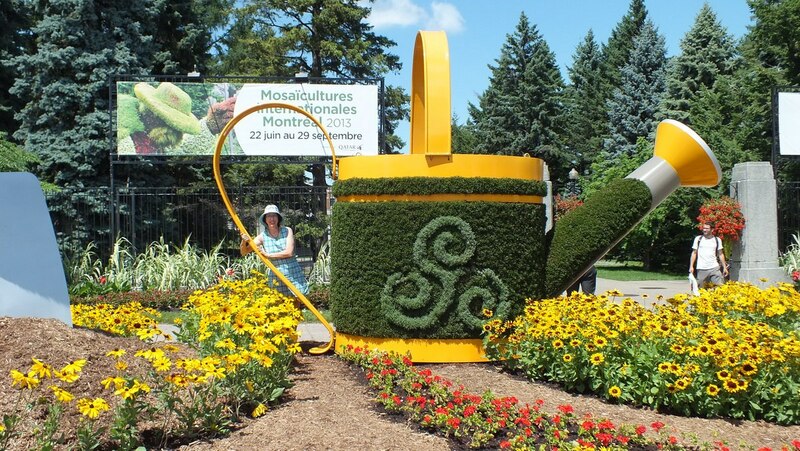 The main gate of Montreal Botanical Garden features a giant-sized watering can, which, come to think of it, really is proportional to the vast array of flowers and plants waiting to be discovered within its boundaries. 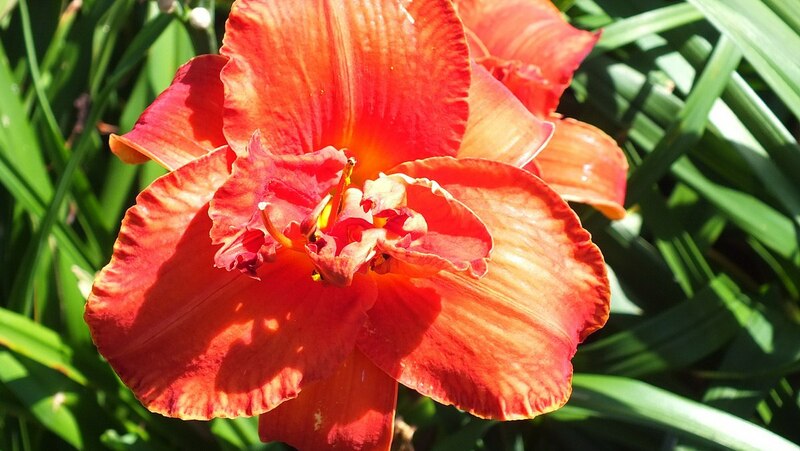 when compared to a paler example of a red daylily, hints at the vast amounts of hybridization that has taken place by gardening enthusiasts and professional horticulturalists over the years. 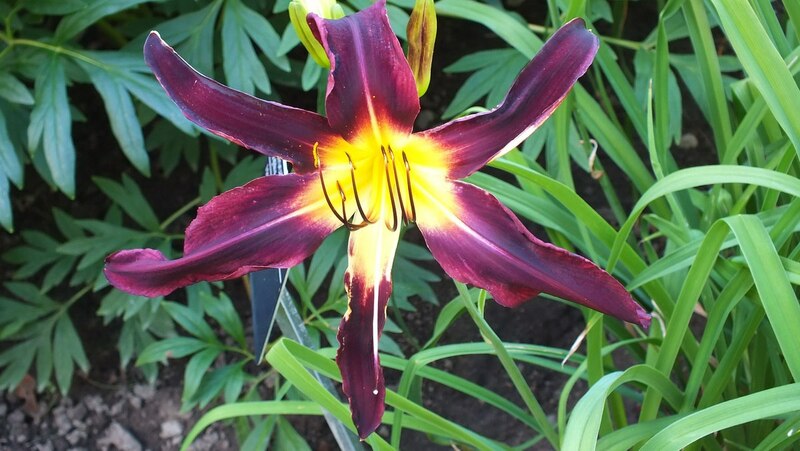 but it is when I got up close to any one individual flower that I could see the finer details and subtle differences between the cultivars and distinguish one from the other. 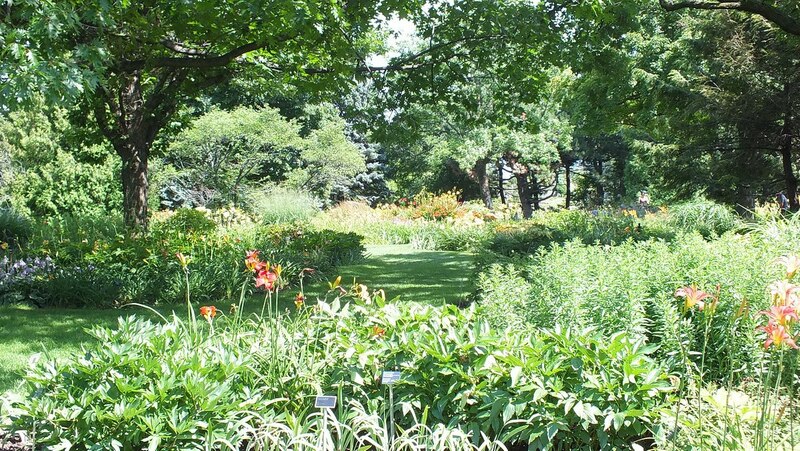 The beds of daylilies were artfully laid out along a babbling brook complete with a wooden bridge where visitors can pause and take in the overall vista. 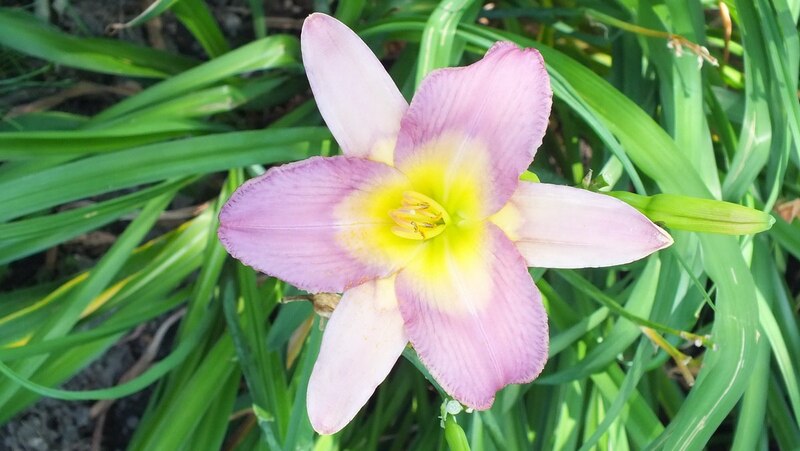 Only a stone’s throw away from the largest pond within the Botanical Garden, the Daylily Garden is a delightful location to pause for awhile on a park bench or to share a picnic beneath one of the shade trees at pond’s edge. 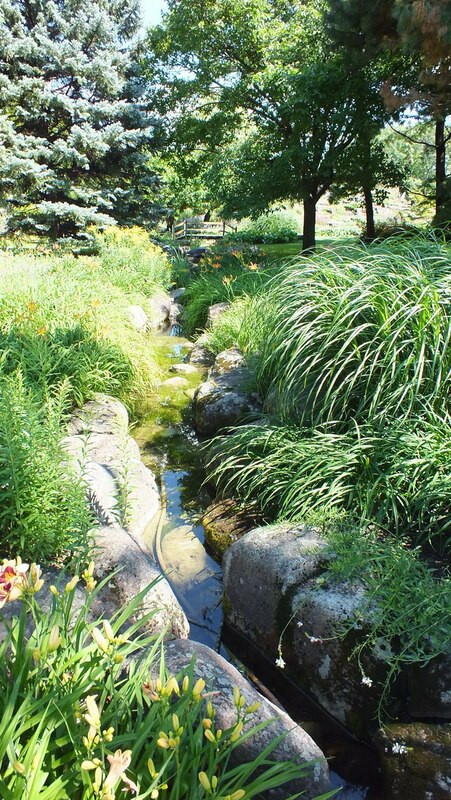 The slender leaves of the lily plants arched gracefully over the flowing water, and quietly whispered in the breeze. 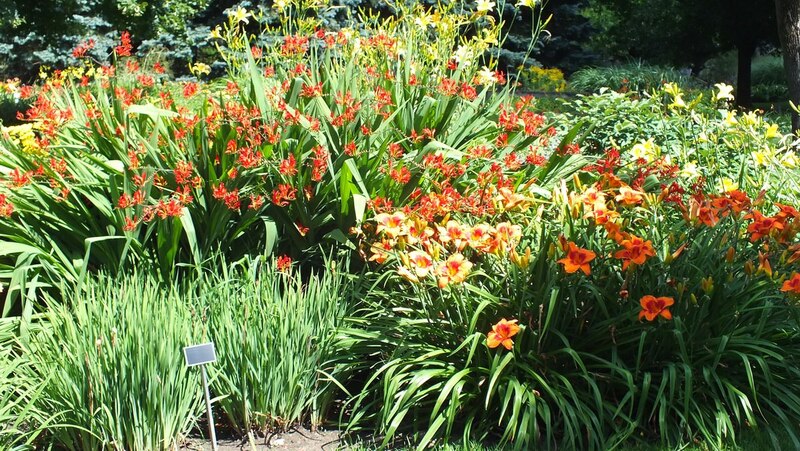 For as far as the eye could see, one planting of daylilies merged into the next, together representing all colours of the rainbow. 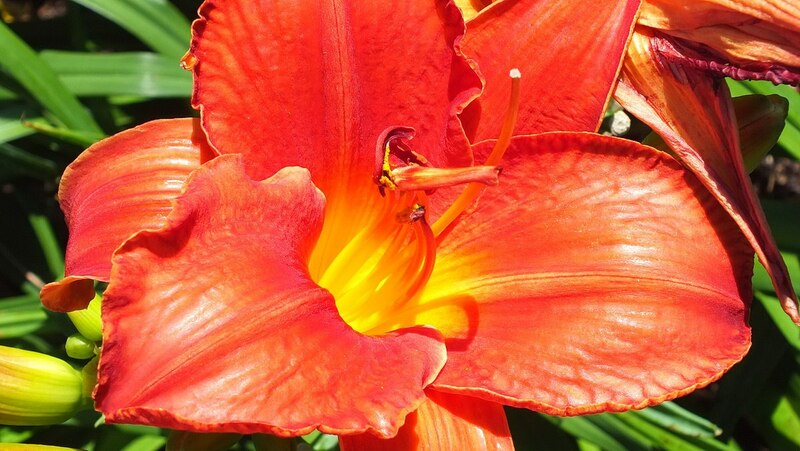 Daylilies are not true lilies but belong to the genus Hemerocallis. The word is composed of two Greek words, Hemera meaning day, and kallos meaning beauty. 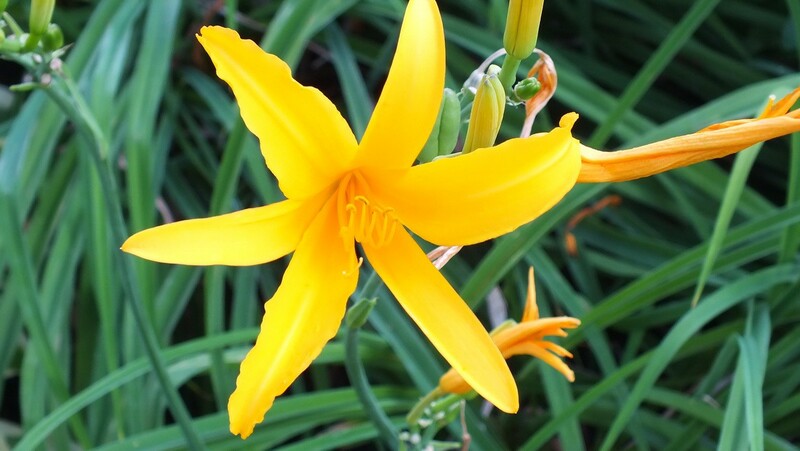 This denotation is very appropriate since each daylily flower blooms for only one day. 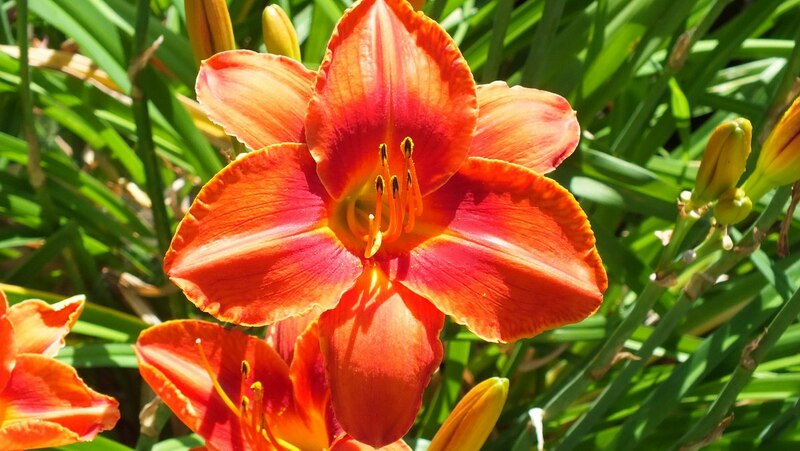 That may seem like a shame, given the intricate and delicate blooms, but a daylily plant produces an abundant quantity of flower buds that open over a prolonged period of time. 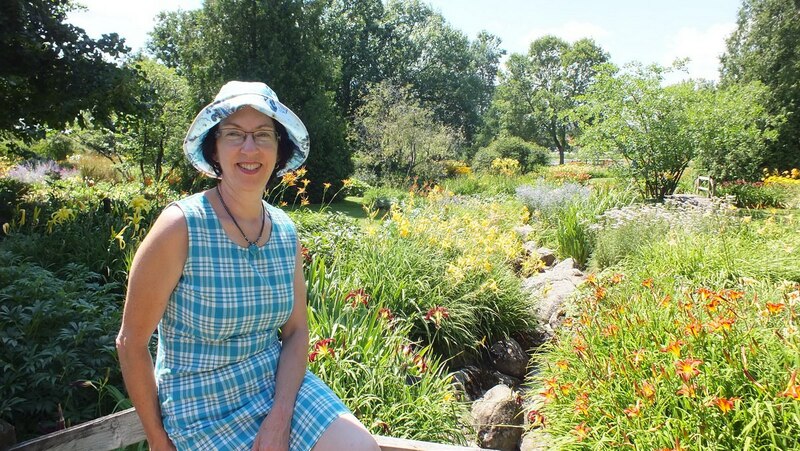 It is important, when possible, to remove spent blooms to prevent seed production, but in a place such as the Botanical Garden, I can’t imagine there would be sufficient hours in a day to accomplish that task. 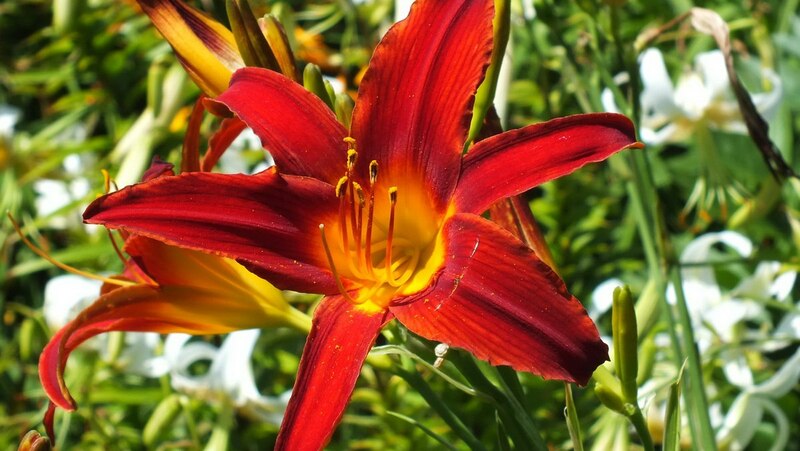 The blooms on most species of daylilies open early in the morning and wither up by nightfall, but there are some newer cultivars that actually have flowers that open at dusk one day and can be enjoyed until the following evening. These night-blooming plants are usually quite fragrant. 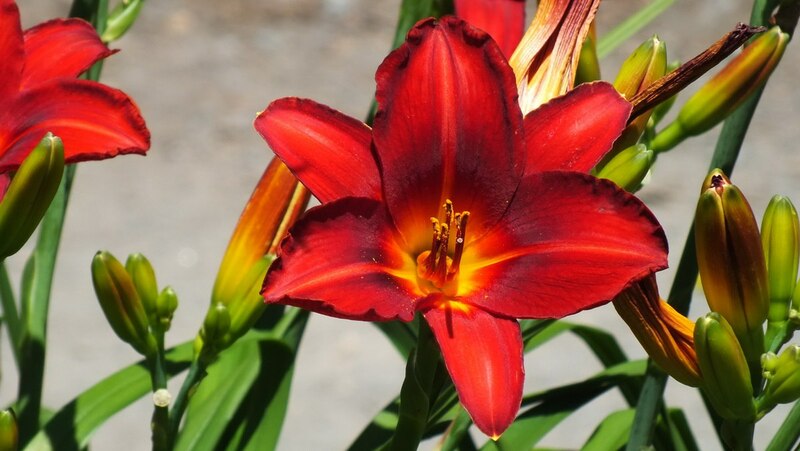 One of the nice things about daylilies is that they are hardy, rugged and adaptable perennials that grow well in a wide range of light and soil conditions. They can also tolerate a fair amount of negligence and still provide beauty in a garden for many years. 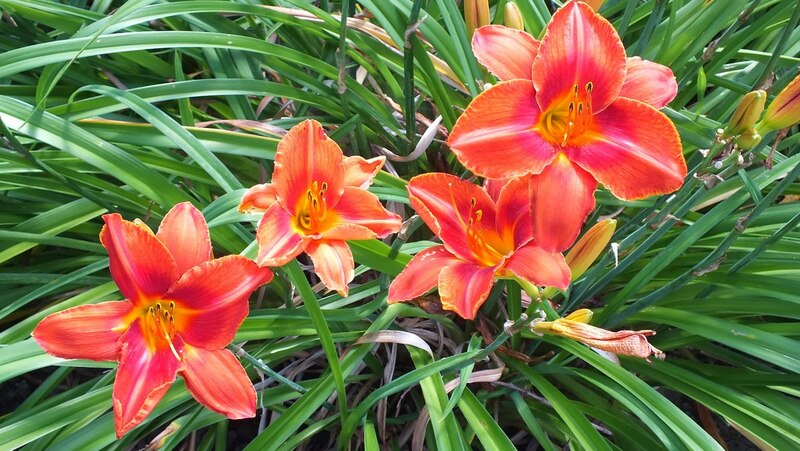 Because daylilies are vigorous growers, they will quickly establish themselves and form a dense clump of leaves supported by a crown. 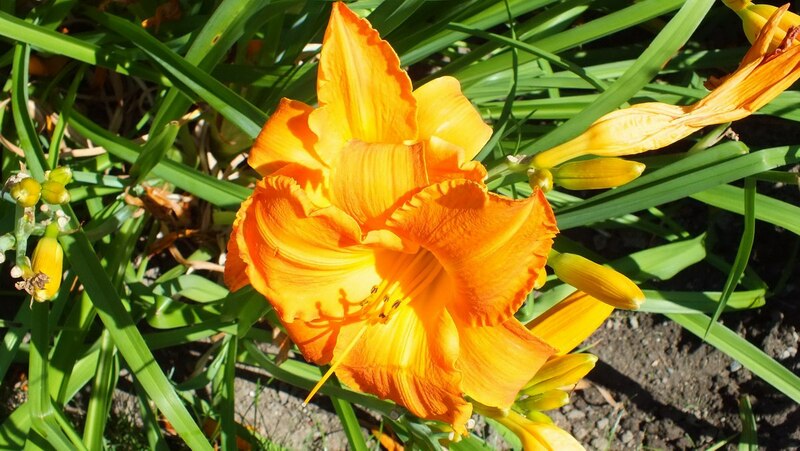 It is recommended that daylilies not be planted next to trees that will compete for moisture, but in my own garden, I have had great success with a very fragrant heirloom variety of yellow daylily (Hemerocallis lilioasphodelus) planted at the base of a linden tree on the boulevard. 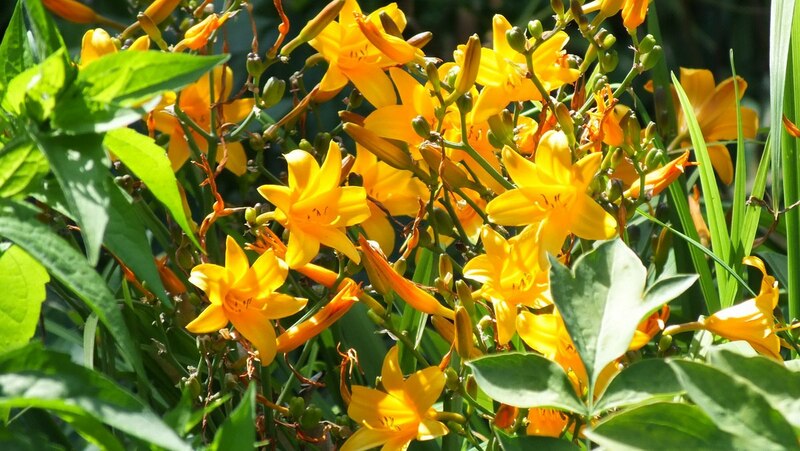 Early every June, my lemon lilies produce oodles of clear yellow, funnel-shaped blooms on tall, graceful stems. 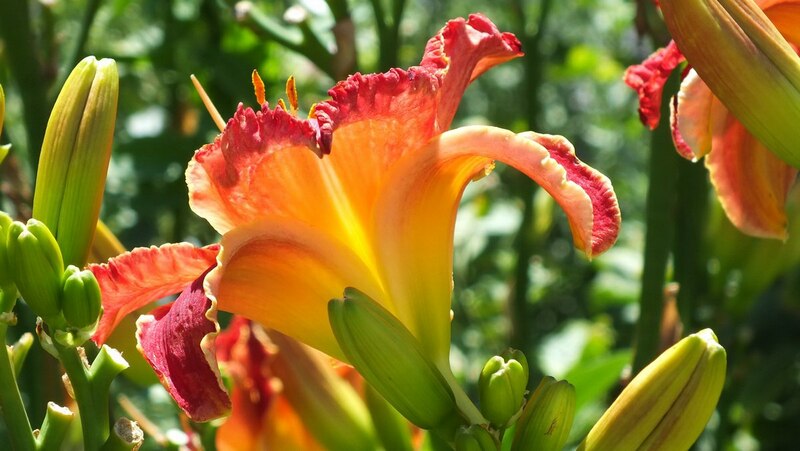 Early each morning, I take a tour of my garden and always stop to smell these wonderfully-perfumed daylilies. I also take a moment to remember their provenance. Bob and I saved them from a heritage home that was being bulldozed nearby – a beloved plant from the Victorian garden so painstakingly cared for by generations of farm families. I like to think, that in some small way, we continue to nurture the root stock that was so lovingly transported from Europe centuries ago. It makes us feel connected to the pastoral roots of our neighborhood. 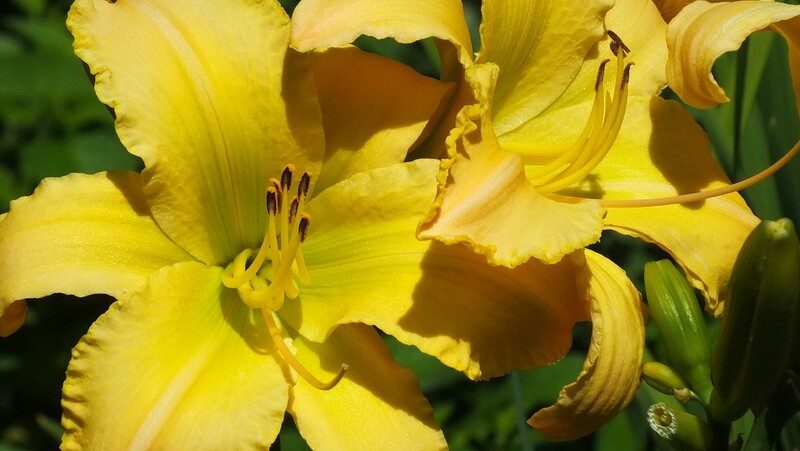 I didn’t take a whiff of these sunny yellow daylilies at Montreal Botanical Garden, but they definitely caught my eye. They are a later blooming variety than my own as we enjoyed them while visiting the Garden in late July. 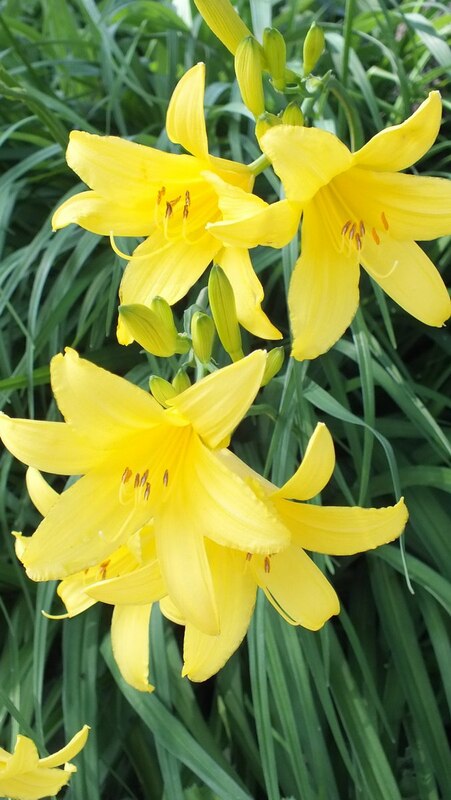 This lemon yellow cultivar, like almost all daylilies at Botanical Garden, was planted in full sun. 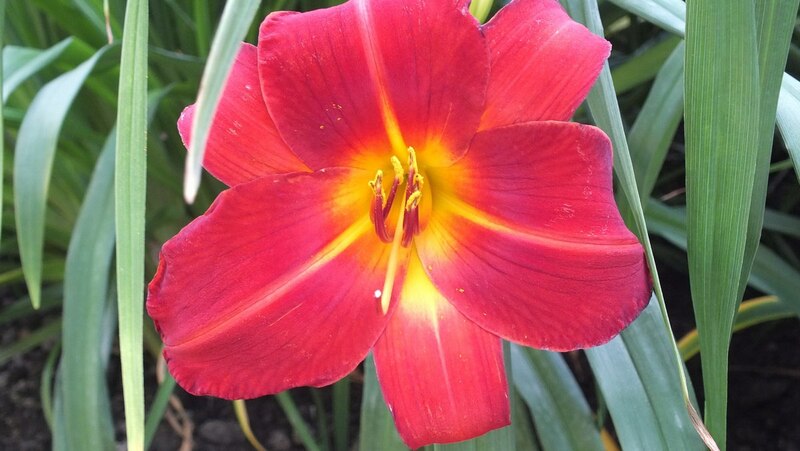 That is where most daylilies flourish. 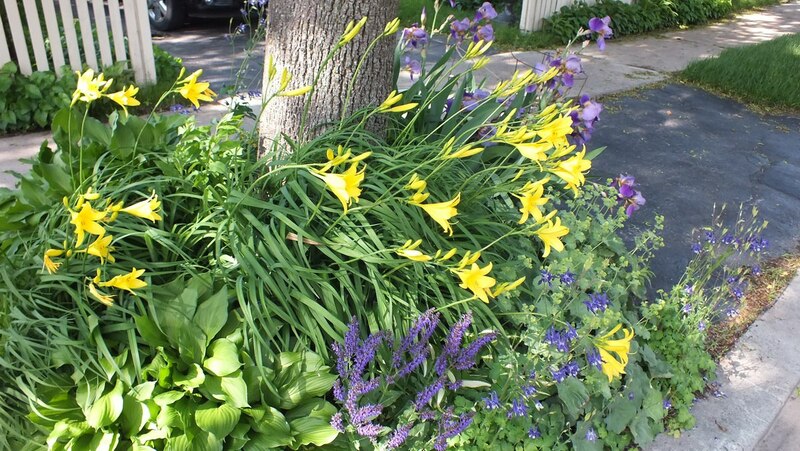 In fact, they are adept at tolerating drought conditions, but do better in moist, well-drained soil. 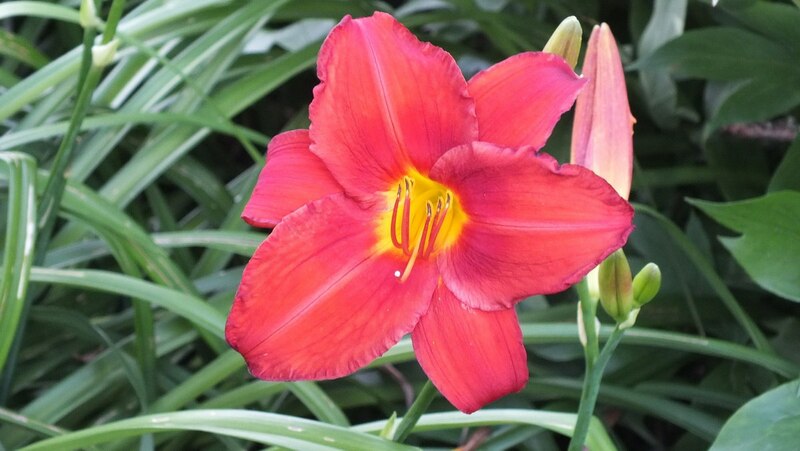 My own daylilies, on the other hand, grow in semi-shade that may help preserve the blooms in the heat of the day. and this plant with its exquisite fringed red blooms also demonstrate the wide petals and ruffled edges that are characteristic of some cultivars. 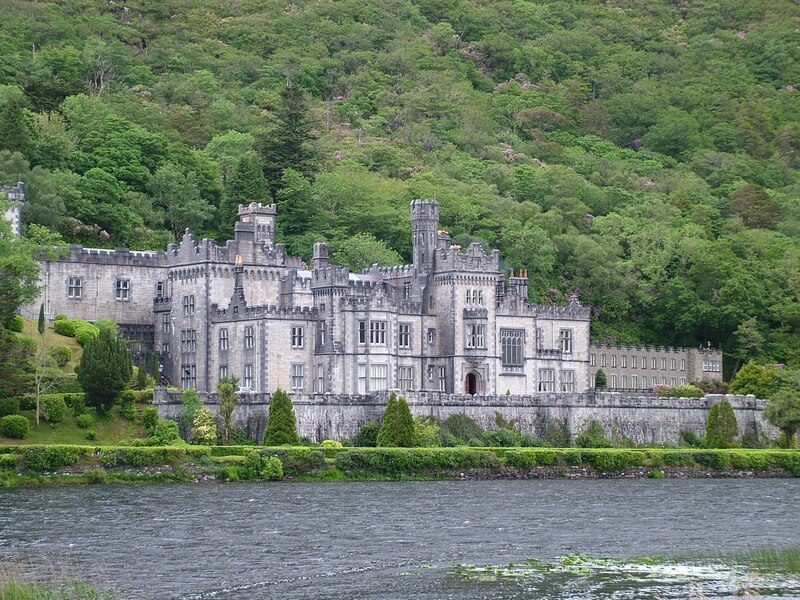 They seem very ornate and complicated but are stunning. 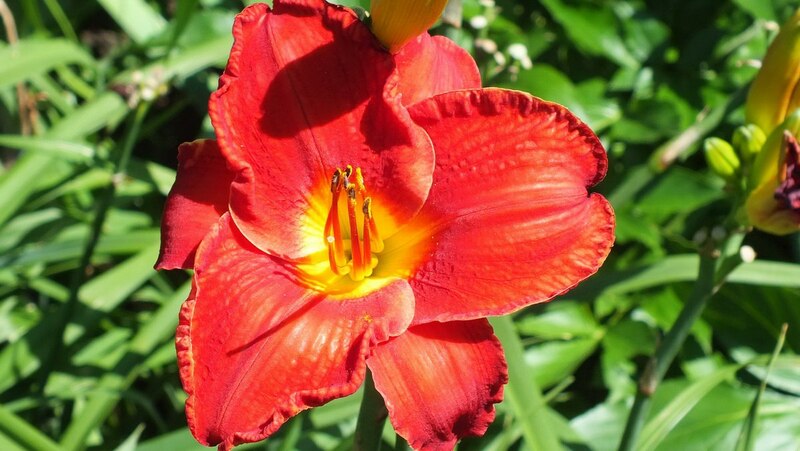 Other daylilies are called spiders because of their long thin segments resembling spider’s legs. 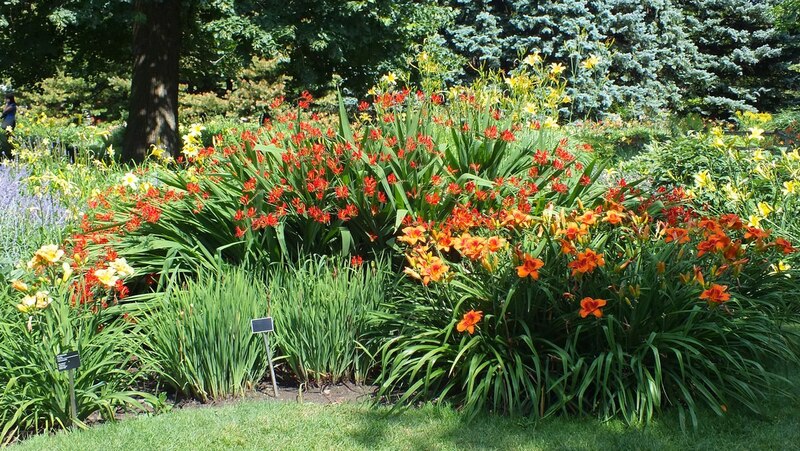 Some of my favorite daylilies at Montreal Botanical Garden were the doubles. 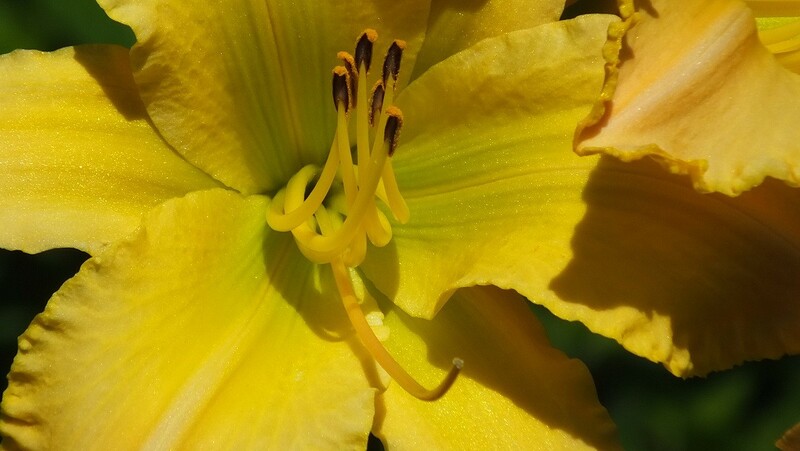 With double the number of petals and sepals, each flower seemed so luxurious…almost regal. whereas those in darker colours absorb the heat of the sun and so could tolerate a bit of shade. 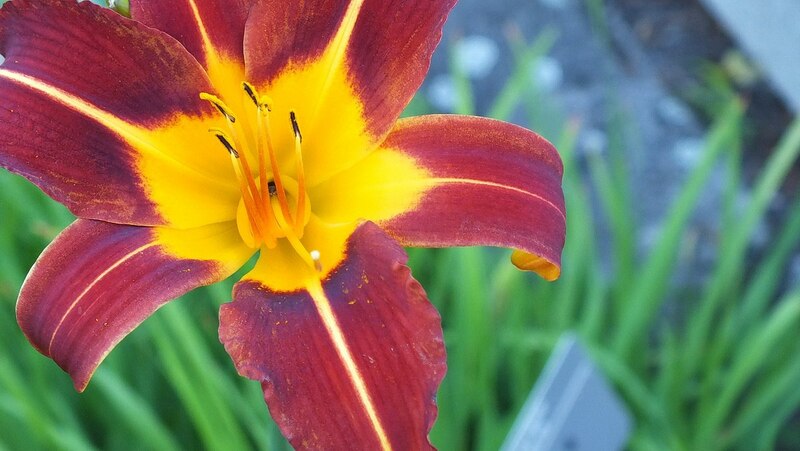 I photographed dozens of the daylilies at Montreal Botanical Garden being no less impressed with each new discovery. 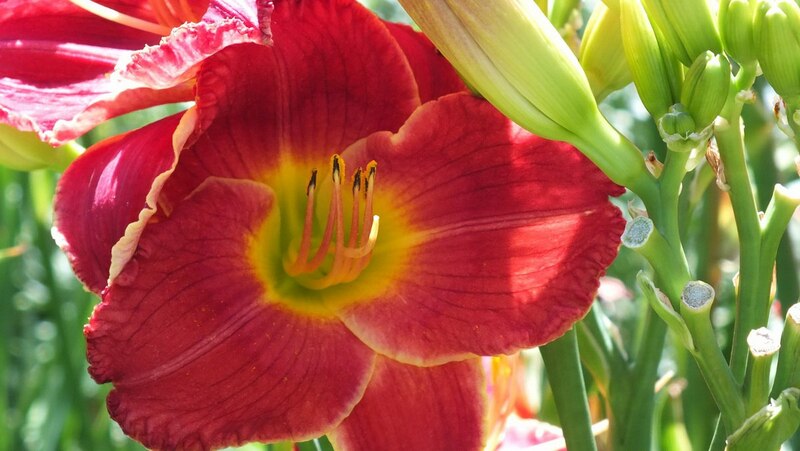 I never knew that daylilies came in so many varied colours. 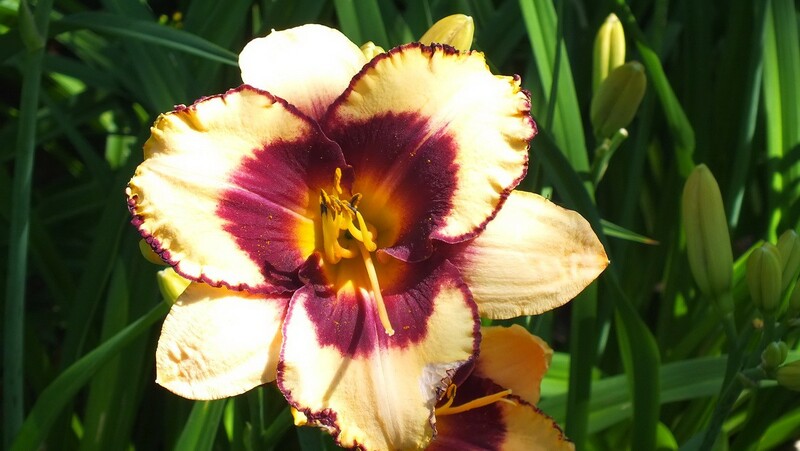 I have since learned that daylilies are available in all colours except pure blue and pure white, but if hybridizers have anything to do with it, I’m sure those colours will be available in the near future. On a bit of a sour note, I took notice, while at the Botanical Garden, of an unusual looking apparatus hanging from the branch of a low shrub. 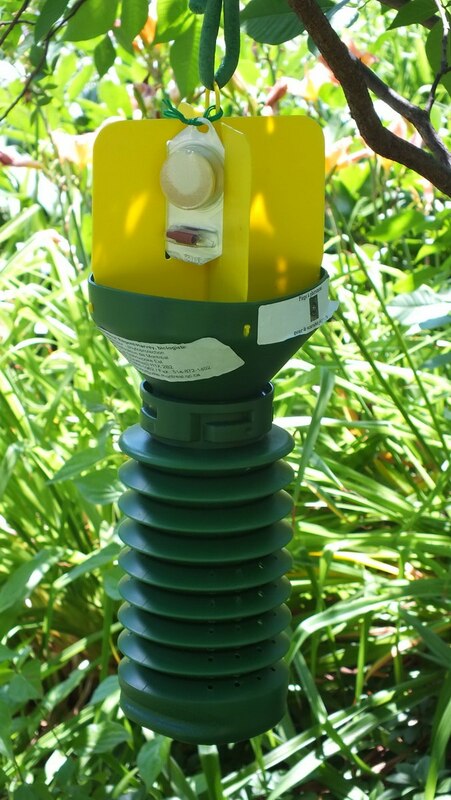 I instantly recognized it as a pheromone trap for the dreaded Japanese Beetles. I had not seen one of these insects on any of the daylily plants, but when I peeked through one of the tiny holes in the trap, I could see several of the colourful beetles crawling around inside. I guess the traps must do the trick! I may have to invest in one of these traps for my own garden next summer. Last year, for the first, I noticed a few Japanese Beetles on my raspberry bushes, but this year, I had to perform numerous inspections each day to keep the beetles in check on my roses, rose of sharon, and several other species of plants. 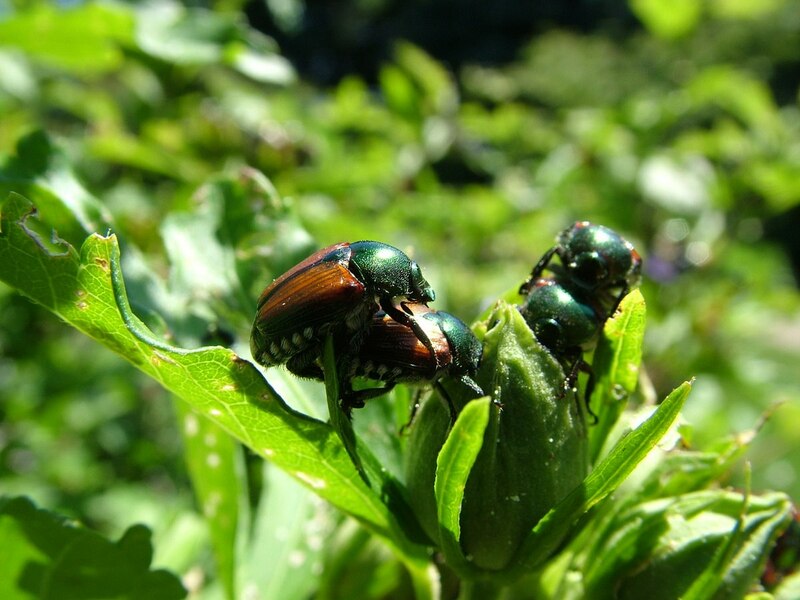 Japanese Beetles are already a prolific invasive species in our neighborhood park. 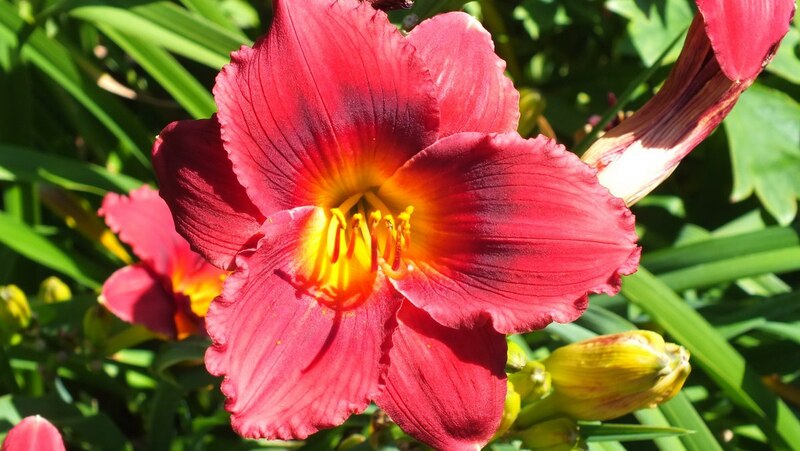 Bob and I spent an undue amount of time circling the endless beds of daylilies. 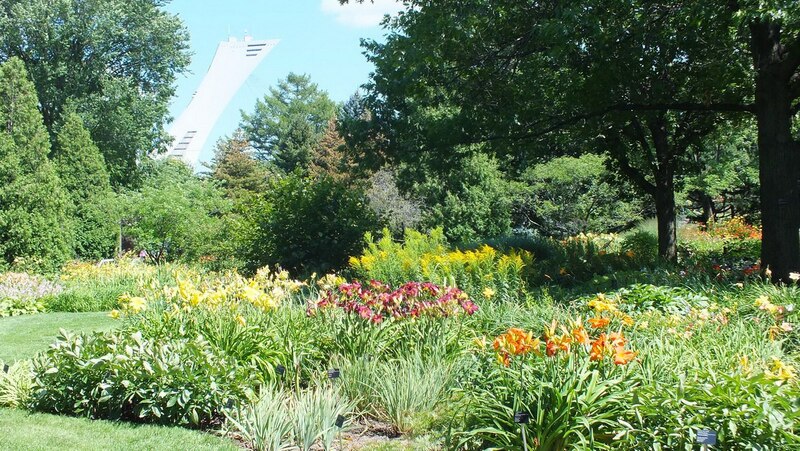 In speaking with a couple of the gardeners, we learned that a good share of the daylilies planted at Montreal Botanical Garden are old daylily cultivars, but they are certainly just as showy as the newer ones. 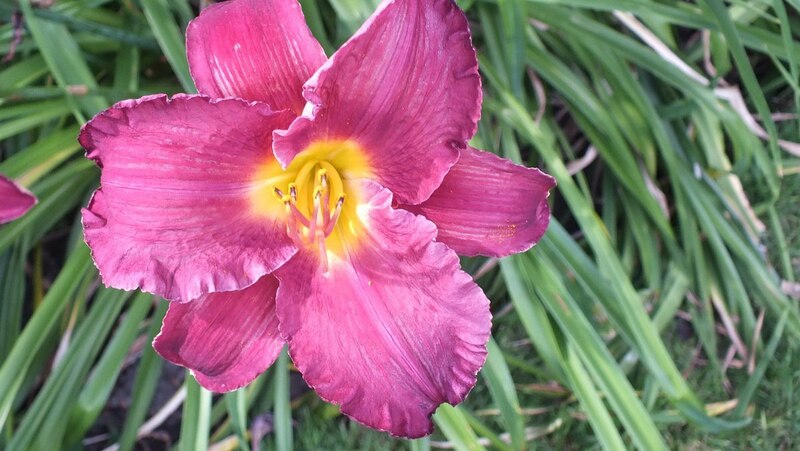 Even though daylilies have a relatively short blooming period, with the hundreds of different cultivars planted, the vast gardens are filled with a non-stop show of colour from early spring to fall. 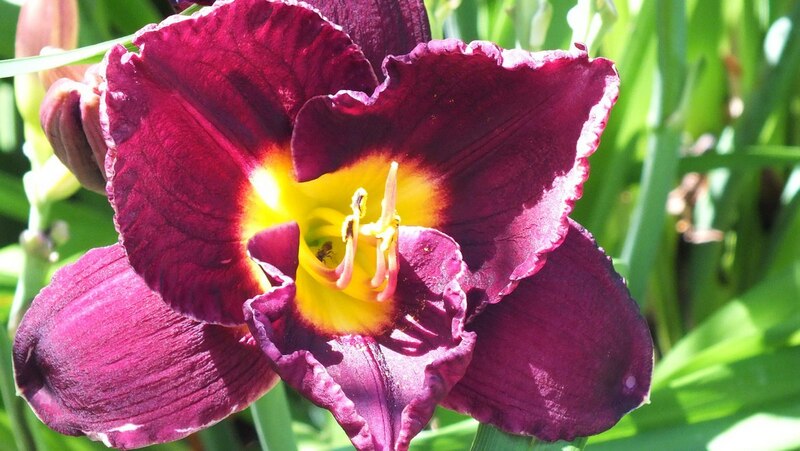 visitors to Montreal Botanical Garden are sure to be wowed by the daylilies such as this maroon show-stopper with a vibrant yellow throat. 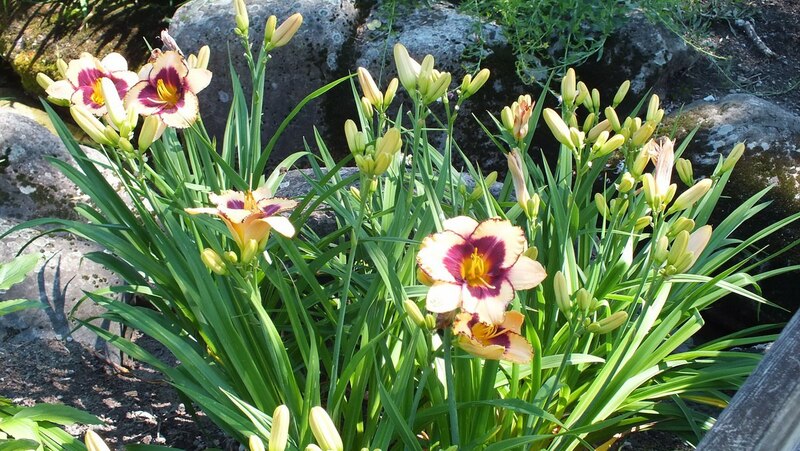 It is quite unbelievable that established clumps of daylilies can actually produce between 200-400 flowers in one season, depending on the cultivar. 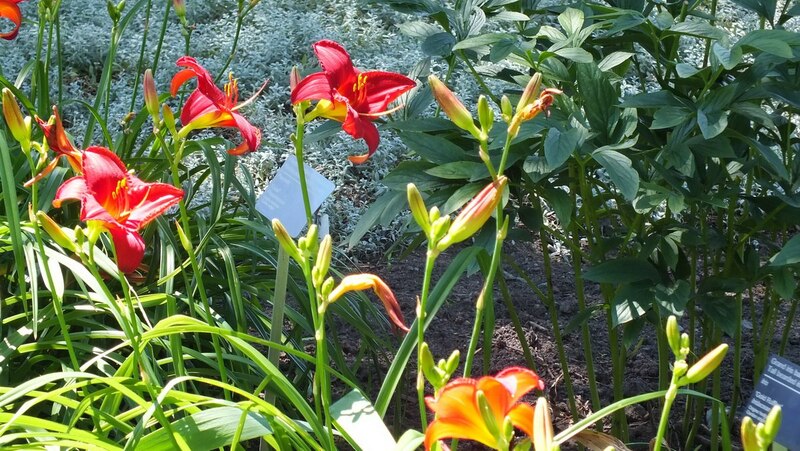 With careful planting, so one shade of daylily compliments the next, it is no wonder that the Daylily Garden at Montreal Botanical Garden is a favorite among daylily enthusiasts. I know I sure enjoyed my visit.